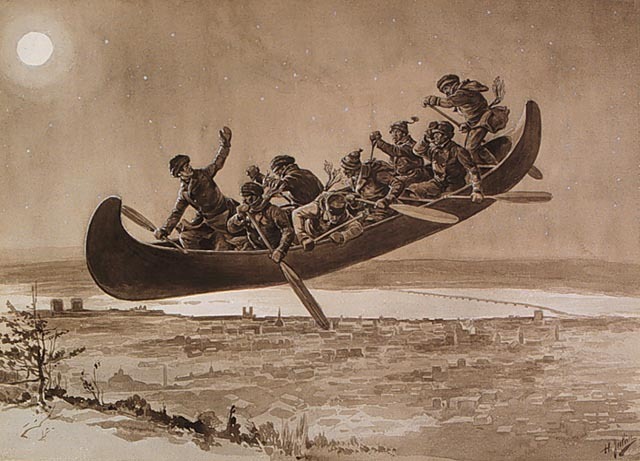 “Flying Canoe” is a dance interpreting a French-Canadian legend called “La Chasse Gallerie”, which combines elements of early colonial life with Native American stories of a magical canoe that flies through the air. The dance depicts the fortitude and “Joi de vivre” that were mainstays of daily frontier existence (and mythical goings-on) in and around the Great Lakes and waterways of the North American continent during the 17th and 18th centuries. View video of the premiere performance at Winona State University, Winona, MN, in Feb. 2011.